Have you purchased your first pumpkin of the season? If not, there’s still plenty of time to head out to your local patch. But it’s never too early to cook with this healthy ingredient. 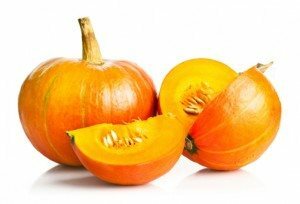 Pumpkins are rich in vitamin A, which benefits your vision; is an excellent source of fiber; and may protect your heart (it may reduce so-called “bad” cholesterol). These are easy to make—you can whip them up in 10 minutes. Among the key ingredients are brown sugar, flour, cinnamon, nutmeg, ginger, cloves, canned pumpkin and vanilla extract. They’re sure to be a hit among your kids; they might just taste a little like the pie variety. Get the recipe here. Chances are, you’ve never tried a shake made from pumpkin. But it’s a delicious—and quick—dessert, and the recipe is very creative. It’s made with reduced-fat vanilla ice cream, fat-free milk, canned pumpkin, brown sugar, pumpkin pie spice and fat-free whipped topping. You simply combine them in a blender and top with the whipped cream. You’ll find the recipe here. Why not make a meal with pumpkin? This savory recipe was inspired by mac and cheese and is quick to prepare. It involves hazelnuts, orecchiette pasta, sage, pumpkin puree, mascarpone cheese, Parmigiano-Reggiano cheese and chives. Get the recipe here. Here’s a fun alternative to pumpkin pie—a mousse layered with whipped cream and gingersnap crumbles. This recipe uses pure pumpkin, as well as gelatin, brown sugar, nutmeg, ginger and cinnamon. It’s a great way to finish off a meal. You’ll find the recipe here.